If you follow me on instagram or facebook, you know that part of my New Year/new me initiative is getting back to cooking healthy family meals again. With all the work that Jacinda and I have been doing on our book, I had been letting business take over and letting dinner time slide – we were starting to have one too many pizza nights, if you know what I mean. I think the reality is that you can head to the grocery store or farmers market and leave with a haul of amazing fresh veggies and the best of intentions to prepare delicious, nutritious meals every night – and then life gets in the way, and the veggies spoil, and you are out the cash and ashamed of yourself for letting perfectly good food go to waste. Am I making any sense? If you can relate, please leave me a comment to make me feel less alone. 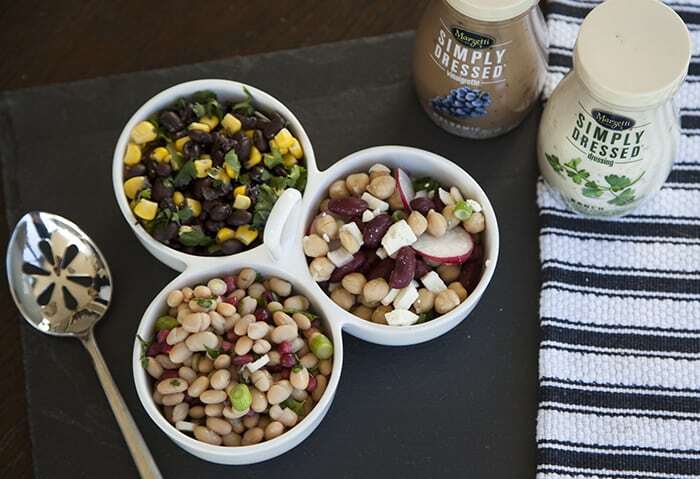 Here we have white beans (rinsed and drained), pomegranate seeds (fresh or frozen), diced scallions (the whites and light green parts), parsley (fresh or dried), mixed with Marzetti Simply Dressed Balsamic Salad Dressing. Would you ever guess this would have come from the pantry? And that a child would eat it? Because mine did. I told her the pomegranate seeds were fruit pop rocks that explode in your mouth and it worked. True story. 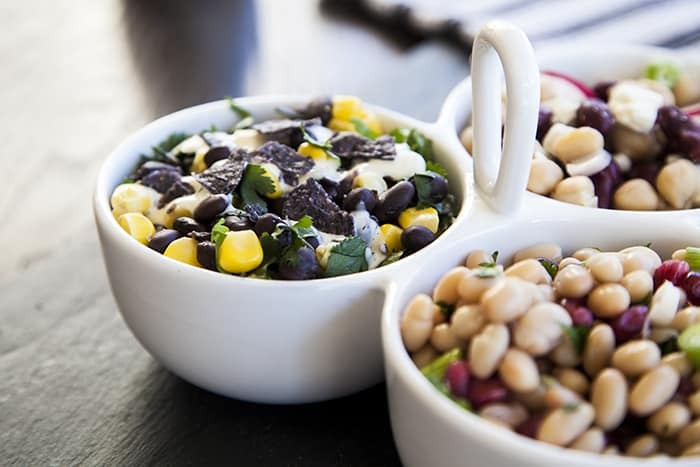 Next up we have black beans (rinsed and drained), a can of corn (rinsed and drained), cilantro (fresh or dried), crumbled tortilla chips (we used blue corn but you can use whatever you like, because I like you), tossed with Marzetti Simply Dressed Ranch Salad Dressing. I think some diced roasted red peppers would have been a great edition but I need to restock my pantry with those. 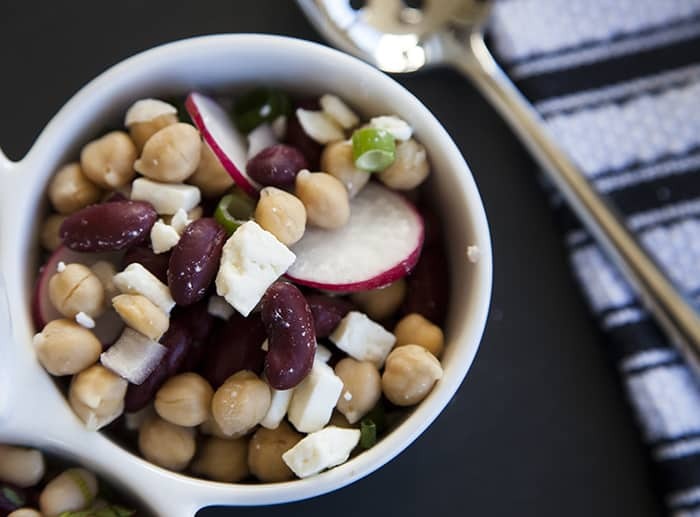 And for a greek-ish twist of goodness I combined kidney beans (rinsed and drained), garbanzo beans (rinsed and drained), diced red onion, diced scallions, thinly sliced radishes, and feta cheese, mixed with Marzetti Simply Dressed Greek Feta Salad Dressing. 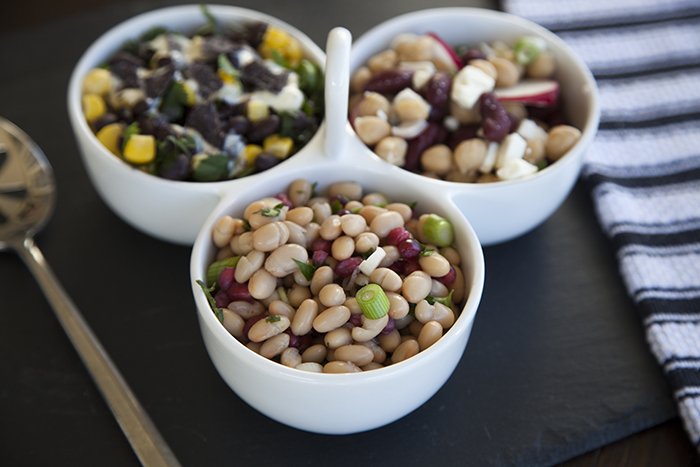 So now I have revealed my secret Last Minute Pantry Salad Trick – I hope it inspires you to create some easy recipes and share them with us in the comments! We have been invited to participate in a Marzetti® ambassador program. This post is sponsored by Marzetti and product has been provided by them. The opinions and ideas expressed are our own. Thank you for helping support the brands that keep us inspired in the kitchen. And these are yummy and vegan, on my taste. yes! we aren’t vegan but we love eating vegan. Love this. I am definitely with you on the fresh veggies + good intentions = rotted veggies thing. I have on more than one occasion purchased several fresh items only to weeks later realize they have gone to waste while I was eating… Let’s just say not exactly salads. 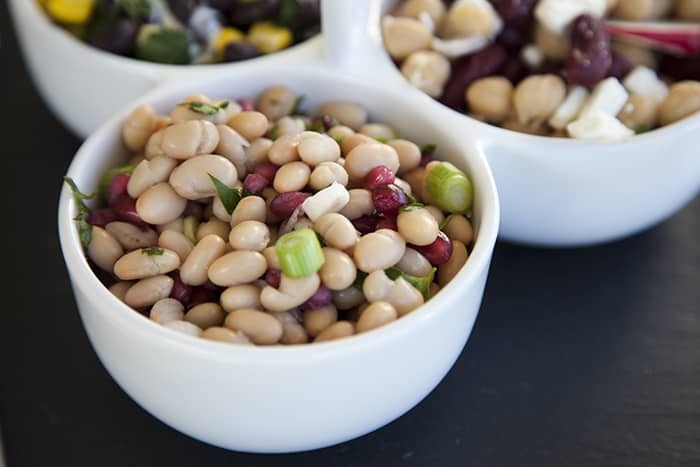 I would also enjoy something like this with edamame… I’m not sure whether it comes in cans but frozen the preparation is very quick as opposed to dry beans.